After integrating Google+ Local features into its Google Maps application, Google is planning to retire the Google+ Local app for iOS on August 7 and has already removed it from the App Store. We're emailing to announce that the Google+ Local app for iOS will be retired on August 7th, 2013. 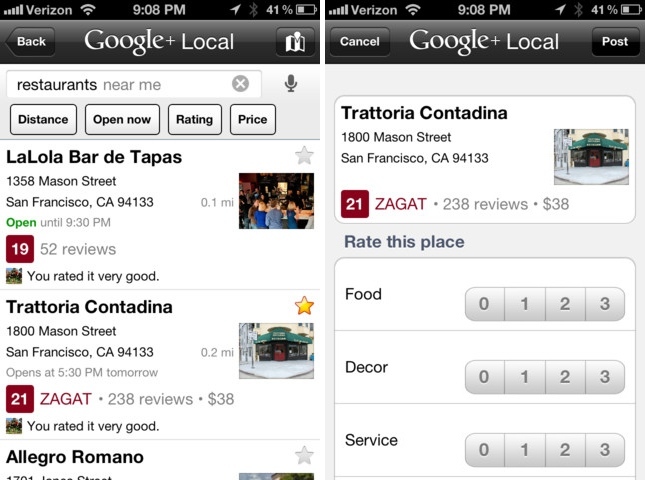 The good news is that all features in the Google+ Local app are now available in Google Maps for Mobile on iOS devices. According to the email, users of the app will no longer be able to access content within the app as of August 7, though reviews and ratings that have been made will be available via Google+ profiles and in the Google Maps iOS app. It's built into Google Maps now. Why can't you continue to use it? Maybe they haven't upgraded to iOS 6? The recently updated Google Maps now requires iOS 6. ...Why does a map app need social features? I'm surprised the CEO didn't announce to the media that it was Apple's decision to remove it, he kept making it sound like Apple was keeping them out of the App Store even when they hadn't submitted an app. No, I don't really know either. It doesn't, but people seem to like it. "Hey, you should join Google+ so I can add you"
"Okay, but what G+ app do I download?" "Oh yeah, just download the Google Maps app"
While I agree with the sentiment behind your comment... at least this is a case where combining the features actually made some sense. And, unlike most Google+ related news over the past two years, the move went the other way. Usually they shut down some useful app/project and declare "but you can now do the same thing (sort of) in Google+!" How so? I found it to be useful for finding restaurants nearby that are open.